As it is with most little girls, my dad was my first hero. I am the third of four children, and I always tell people I was my dad’s son before my brother was born. He taught me to throw a baseball, punt a football and even taught me to sew a dress for my Barbie doll. My dad passed away in September 2012, but because of his diagnosis with Alzheimer’s disease in 2001, we gradually said goodbye to him over the course of 11 years. I lived out of state during that time but visited my parents at least monthly. And watching my father succumb to this horrible disease was one of the most difficult things I’ve experienced. Most often Alzheimer’s is associated with the loss of memory. I never think it is funny when someone forgets something and then jokes, “I must have Alzheimer’s.” There is nothing funny about that disease. It truly robs sufferers of everything—from memory to the ability to speak to dignity. My father’s Alzheimer’s started with paranoia—thinking people were coming into the house and changing the times on the clocks or moving things from one location to the next. That was followed by the loss of his ability to process information and although he still remembered us, he often talked about going to see his mom and dad (who had both passed years earlier). As with most Alzheimer’s patients, my dad started to wander. He would pace endlessly around the house all day and much of the night. One night he even climbed out his bedroom window and walked more than a mile to a nearby recreation area. Thankfully, some neighbors who had gone to the area to walk the next morning spotted him and brought him home. It was after that incident that my mother had all of the windows nailed closed from the inside. She also added alarms to each entry door so dad couldn’t go outside without her knowing it; and added baby locks on the cabinets after dad ate a dishwashing tablet thinking it was candy. Alzheimer’s caused my dad to become very childlike. He liked playing with and holding toy cars. On one visit, I was in the backyard walking around with him when he picked up an acorn and threw it at me. When I turned around, he just grinned impishly. I was crying inside, but I just had to smile because that is something my dad would have done before the disease. While dad was very different and needed around-the-clock care, he was still very much my dad. The disease also took a toll on my mother who was dad’s caregiver. Not only was it emotional to deal with the fact that your husband of 50-plus years was no longer the same, it wore on her to have to make sure she knew where he was 24/7. One of the things I say to anybody who is a caregiver is you have to take care of yourself! Stress plays havoc with our overall health. Mom finally agreed to have a home health worker visit three days a week, and one of my sisters moved in with my parents to help care for dad. My other siblings and I gave my mom and sister breaks on the weekend so they could be away from the house while we would watch dad. It only made sense that the weekends I was visiting, I would toss the ball with dad. It was just like old times—sort of. I wish that no one would have to deal with this disease—no individual and no family. But the truth is that today, 5 million Americans are living with Alzheimer’s; the disease is now the sixth-leading cause of death in the U.S.; and every 66 seconds someone in the U.S. is diagnosed with the disease, all according to the Alzheimer’s Association. My paternal grandfather and my father both had Alzheimer’s, so I’ve read a lot of research about how to prevent the disease. Unfortunately, no one can pinpoint the exact cause. Researchers have identified many things such as environment, diet, etc., but currently there is no cure. It was about 10 months before my dad passed, Christmas of 2011, when I realized for the first time he didn’t know who I was. That was extremely tough to accept, but it was not about me. My dad was very different from the man I knew as my first hero, but in my heart he was still my dad. Susan handles communications for the UT Institute for Public Service. 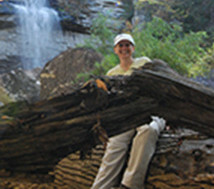 She enjoys spending time outdoors—hiking and documenting the natural beauty of East Tennessee through photography. Susan loves watching all sports, reading, cooking and fulfilling the needs of her demanding miniature dachshund, Wrigley. Hey Susan you have hit the nail on the head about Alzhelimer Disease . You and the family no first hand Robi and Uncle James love you and the family. Susan, this is such a good article. I have very fond memories of Doby & Peggy. I remember how hard it was when PaPa Robertson (Robert Edward Robertson, Sr.) had Alzheimer’s. I remember how sweet and patient your mother was. Even after my divorce they let me know I had an open invitation to visit if I was in the area. Thanks for writing this and making us aware of this disease.